It is often forgotten how many families went to France and Flanders during the inter-war period; by the 1930s Ypres alone was receiving more than a quarter of a million visitors from Britain and the Empire. Most such pilgrimages were subsidised in some way as the cost for the average family was prohibitive, but the desire to make that journey was a strong one. 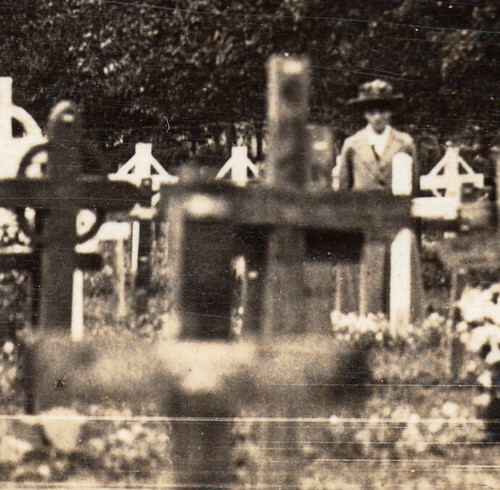 This image is from a small collection taken during one such pilgrimage in the 1920s. There are no captions on any of the pictures but evidence seems to suggest this is Lijssenthoek Military Cemetery, near Poperinghe; at that time it was the largest British cemetery on the Western Front with nearly 10,000 graves; Tyne Cot, today the largest, had as yet not been finished. And when you focus in on this image, among the sea of wooden crosses, there she is – a women looking back at the photographer. Was she a mother, a sister, a wife, a lover, a friend? 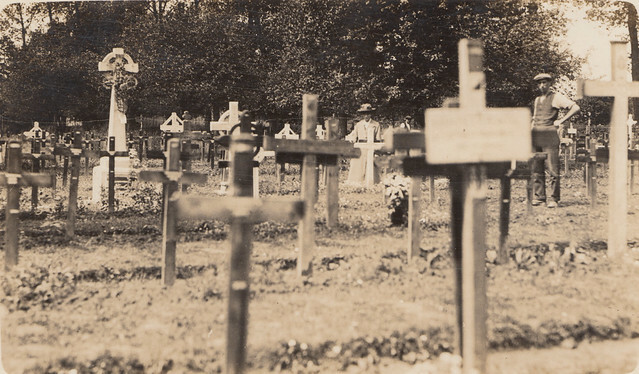 The half-seen face with the smart dress, arms at her side almost as if at attention by the grave – what must have crossed her mind, and the thousands and thousands of other women like her who visited the Old Front Line to make some sense of loss, some sense of the cost of that war? Looking at the name on the cross would she have echoed the words of Vera Brittain, following her own visit to her brother’s grave? This entry was posted on 06/11/2012 by sommecourt. It was filed under Aftermath, Battlefields, Flanders, Great War, Remembrance, War Cemetery, Western Front, Women in WW1, WW1, Ypres and was tagged with Flanders, Lijssenthoek, Poperinghe, Remembrance, Women, WW1, Ypres. I hope everyone who looks at this image today pauses to reflect, just as I have done. We remember those who were left to just pick up the pieces and we remember those that have and will continue to go before us…Lest we forget. I think above all that, in our desire to honour the dead, we forget too those who knew them and loved them, and are remained clueless at the end of the war. The silhouette of this women is a call to remember. It made tears come to my eyes. My mother lost her 19 year old brother in just about the same place in the next war. Does it ever end? Does it ever end? No.